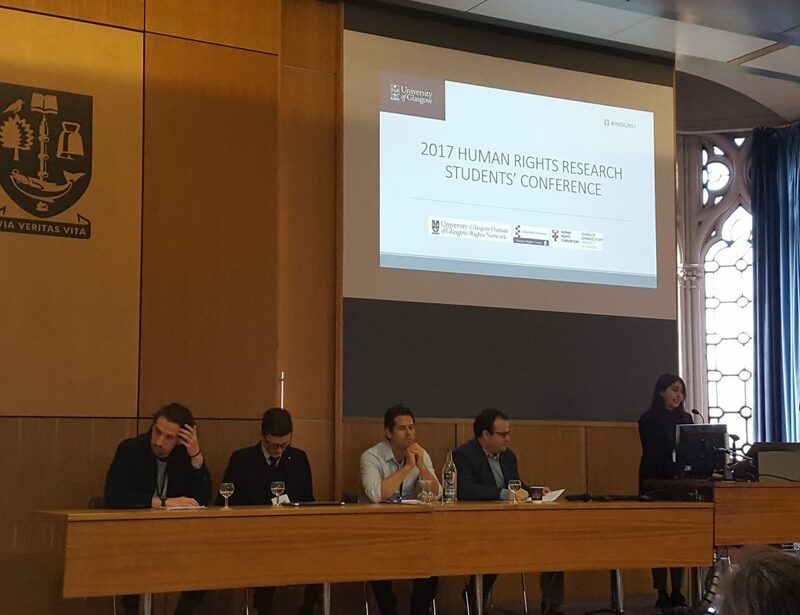 The Human Rights Research Students’ Conference, A human rights postgraduate researcher community: enhancing knowledge exchange, engagement & employability, presented 15 papers in five panel sessions. Held at the University of Glasgow in November 2017, it marked the start of the new researcher development programme of the Glasgow Human Rights Network. the Human Rights Centre at the University of Essex. This event was part of a conference series aimed at UK- and EU-based postgraduate research (PGR) students working within an interdisciplinary field of human rights and social justice. The conference series aims to stimulate research and dialogue on contemporary human rights issues and create a network for PGR students working within the field of human rights. 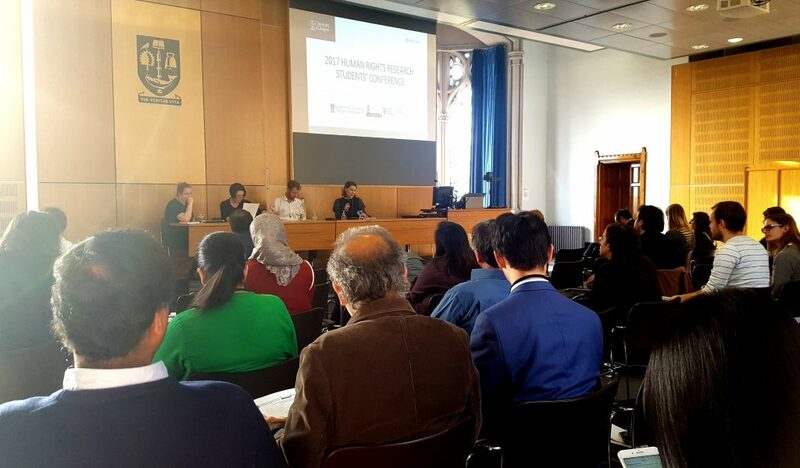 Led by co-convenors of the GHRN Postgraduate Cluster at the University of Glasgow, Asli Olcay and Kumud Rana, the conference also included a Human Rights Practitioner’s Forum which provided students with an opportunity to engage with and build networks with experts from public and third sector organisations. The main conference consisted of 15 papers presented by PGR students from across universities in the UK and the EU drawing on multiple disciplines like Law, Global Studies, International Relations, Politics, Psychology and Sociology. Papers were arranged into five panels focusing on the most pressing contemporary human rights issues. 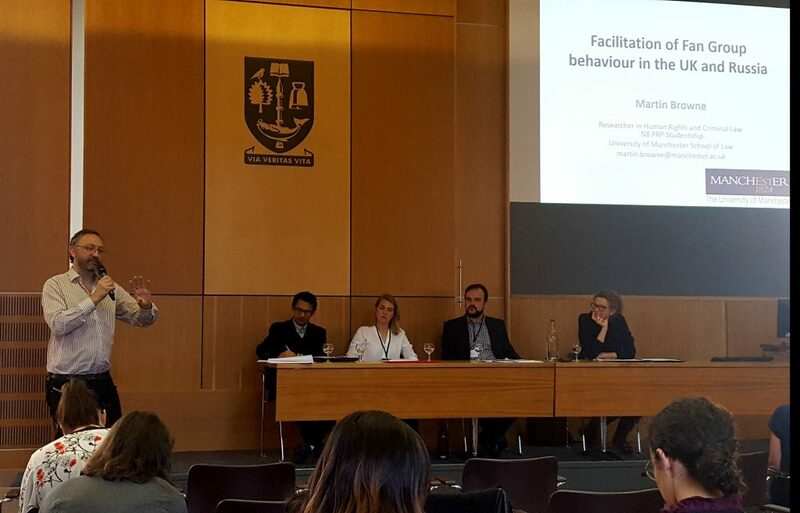 The first panel on Justice and Human Rights in Conflict and Transition was chaired by Dr. Gus Waschefort (University of Sussex, UK) and included three papers. The first speaker Richard Georgi (University of Gothenburg, Sweden) – presented on the often-underrepresented political dimension of human rights activism within protracted social conflicts. Having previously worked for Mexican and German human rights organisations and institutions, Georgi’s paper drew on a review of the political nature of human rights articulations by the Zapatista movement to argue that human rights assume meaning through their positioning within specific discourses while contesting existing social orders. 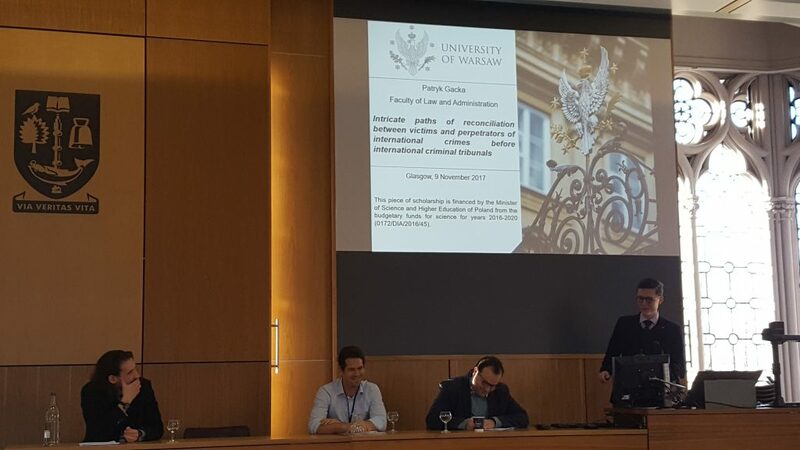 The second speaker Patryk Gacka (University of Warsaw, Poland) – spoke on the intricate paths of reconciliation between victims and perpetrators of international crimes before the International Criminal Court (ICC). Gacka argued that the retributive dimension of international criminal trials must continue to be supplemented by various mechanisms of restorative justice to recognize both offenders and victims of international crimes. The third paper in the panel by Christof Royer (University of St Andrews, UK) critiqued studies on the ICC dominated by a legalistic narrative which presents politics as the bête noire of the Court, as well as studies that offer a simplistic explanation of the disavowal of politics. Royer argued that the law might sometimes be obstructive in achieving the Court’s broader mission of combatting mass atrocities and called for the ICC to be a prudent actor, sometimes even refraining from intervention. The second panel on Immigration and Human Rights chaired by Dr. Francesca Stella (University of Glasgow, UK) began with a paper by Anamika Misra (University of Kent, UK) on the rise of Hindu nationalism and its bearing on refugee rights in India. Mirroring the European refugee crisis coupled with rising anti-Muslim sentiments, Misra took the case of the Rohingya refugees from Myanmar to call for a uniform system of refugee law and policy framework in India, and a concerted effort with other neighbouring countries to maintain a balance between fulfilling humanitarian duties and managing security concerns of host countries. The repercussions of a similar lack in clarity in policies affecting child refugees was highlighted in the second paper by Joline Faujour (University of Glasgow, UK), who has previously worked with children and refugees from East Africa and the Middle East. The last paper by Laura Tennenhouse (Boston College, USA) based on theological ethics proposed a creative approach to the refugee crisis by arguing for a Girardian framework based on interconnectedness and kinship across borders as complementary to the Good Samaritan narrative in migration ethics. The third panel in the afternoon session on Extending the Frontiers of Human Rights Law was chaired by Dr Anni Pues (University of Glasgow, UK). With a research focus on the interaction between public-order policing and human rights, Martin Browne’s (University of Manchester, UK) paper proposed an adoption of a human rights approach over security/safety approach in managing fan group behaviour during World Cup 2018 in Russia. The second paper by Jennifer Glinski (University of Glasgow, UK) was based on a collaborative study with the Scottish Women’s Aid which critiqued the UK government’s social security policies that prevent survivors of domestic violence from leaving their abusers. This study extended the discussion on human rights by focusing on the understated issue of financial barriers for survivors in addition to structural and political barriers. 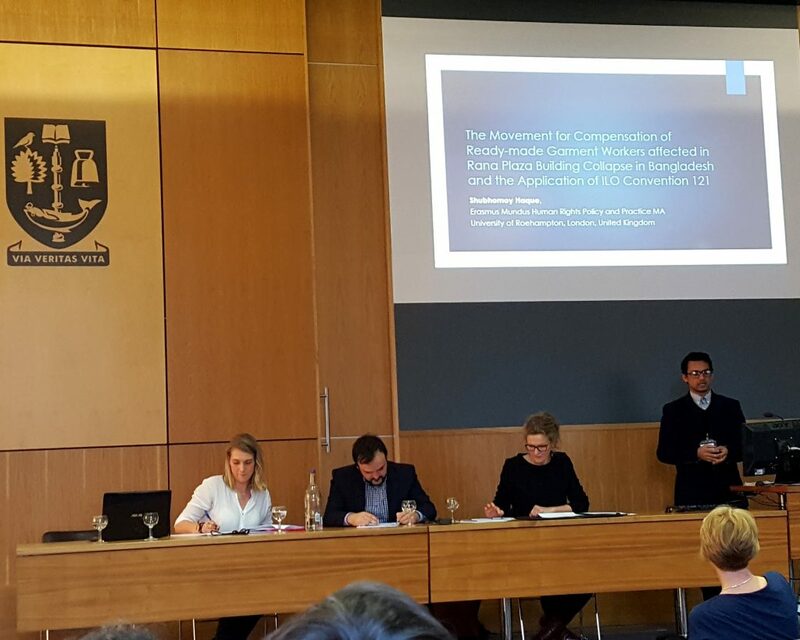 The third paper by Shubhomoy Haque (Roehampton University, UK) provided a contrast to the application of (international) human rights law through a case study of the ILO Convention 121 in the 2013 Rana Plaza collapse in Bangladesh that implicated major North American retailers. Despite transnational solidarity by trade unions in escalating the movement for the compensation of workers through the invocation of the Convention, Haque argued that the final negotiations were a result of complex political and economic agreements rather than the application of universal human rights law. Haque is involved in research and policy advocacy on labour rights and industrial governance issues in the garments and clothing industry in Bangladesh. The first paper on the next panel on Marginalised Groups within Human Rights Protection chaired by Dr. Matthew Waites (University of Glasgow, UK) also dealt with labour standards for female workers in the textile sector in Pakistan. Awarded the DAAD Best Student Award 2015 for her outstanding academic achievements and social commitments, Syeda Aisha Furrukh’s (University of Dortmund and Fulda University of Applied Sciences, Germany) paper was based on participatory research and posed the pertinent question of how local conditions might relate to global norms of human rights standards. The second joint paper by Morgan Telford, Caroline Ploetner and Stephanie Allan (University of Glasgow, UK) also highlighted the significance of collaborative research, this time between academics and people who have accessed social security for mental health problems in the UK. Their study made use of the Austerity Ailments Framework developed by Psychologists Against Austerity to contribute to the understanding of distress in context of economic hardship and austerity, and provided a theoretical basis for future research, clinical practice and policy making. The last panel of the day, chaired by Dr Anna Chadwick (University of Glasgow, UK), focused on Business, Labour and Human Rights. The first paper by Ondrej Svoboda (Charles University in Prague, Czech Republic) explored the role of the National Contact Points (NCPs) established as per the OECD Guidelines for Multinational Enterprises Guidelines in mitigation of impacts of globalised business activities on human rights. Ondrej, a PhD candidate and visiting lecturer at the Charles University and an officer at Ministry of Industry and Trade of the Czech Republic, went on to emphasise the significance of NCPs as quasi-judicial grievance mechanisms in promoting responsible business conduct (RBC) by multinational enterprises through an analysis of the two landmark cases brought before Swiss and Dutch NCPs. The second paper by Sneha Shrestha (King’s College London, UK) also dealt with respect for human rights and social justice in business but from the perspective of biotechnologies. Having previously worked in various human rights advocacy projects, Sneha identified policy options to mitigate the overarching risk of global inequality exacerbated by biotechnologies, including the initiation of corporate social responsibility in case of genetically modified organisms (GMOs) and the application of the Modern Slavery Act 2015 to human genetic engineering (HGE) in the UK. Shifting the focus from business respect for human rights to state responsibilities in preventing forced labour, the last paper by Maayan Niezna (University of London, UK) examined how Bilateral Labour Migration Agreements (BLMAs) can conform to and facilitate better implementation of international regimes on human trafficking, human rights law, and labour law. The one-day conference proved successful in providing a forum for refreshing and fruitful discussions both during well-structured panels and more informally during coffee breaks. It was a first step in the Network’s current agenda of facilitating PGR community building, research dissemination and development of employability skills. ← Blog: Brexit – what now?